It’s been a long cold February, but the Gomers are back to warm things up! Join the guys as they think back on their hiatuses (hiati? ), the disciplines they’ve developed and risks they’ve taken. And did someone order some Gomer Tangents? Try iPad 2 chat, Oscar thoughts, Spring TV talk, and quite possibly the most timely Listener Feedback celebrity impression ever. Duh, I was WINNING even when I was back hitting on Ferris’s sister! 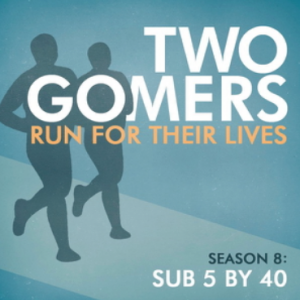 In Episode 7, the Gomers get back to the basics: Weeks in Review, Gomers Tips, two new Songs To Run To, Listener Feedback, and the Monday Survey. Glad to be back, and Happy Running! This week’s Monday Survey: What’s your favorite racing distance? The Nation wants to know! This week’s Monday Survey: What’s your favorite racing distance? Probably a 10K because it doesn’t take too much time out of my day. A half marathon is great because its enough to be a good challenge but doesn’t beat me up too badly. HMs are not as frequent as 10Ks though. 1) Thank you SO MUCH for the song of the week this week, guys- if it weren’t for you, I never would have found “New Morning” by Alpha Rev. The song is AMAZING and I am so glad that I was pointed in its direction. 2) T-shirts? I can haz, pleaz?! ?